Shotaro Omori performs his Short Program at the 2013 US National Figure Skating Championships. Competition began today at the 2013 Prudential U.S. National Figure Skating Championships in Omaha, Neb., marking the first time since 1967 that the competition was held in the Gateway to the West. The novice short programs kicked off the day in the CenturyLink Center, but it was the junior men’s short program that closed out the day’s events that was the talk of the town. Reigning champion, 13 year-old Nathan Chen from Salt Lake City was expected to take the lead in the competition, but it was Shotaro Omori, a relatively unknown 17-year-old, who walked away with the lead. Skating first in the event, Omori set the bar high—opening his program to Misa Tango with an easy triple Axel. After not qualifying for last year’s championships, Omori made a coaching change to Tammy Gambill, a two-time Professional Skater’s Association Developmental Coach of the Year awardee. “To have a skate like this is amazing, and switching to my new coach has helped me in numerous ways,” said Omori. “I feel pretty confident going into the free skate. I want to keep the same focus that I had tonight,” he said. Omori executed all his jumps—a triple Lutz-triple toe loop combination and a required (triple) flip with ease, earning the highest technical scores of the night. His score of 69.87 is a new personal best, and was just a few points shy of the record high score in this event. Finishing in second place is last year’s novice champion, Vincent Zhou, another of Gambill’s pupils. The 12-year-old performed with a lightness and sense of humor to selections from “The Sorcerer’s Apprentice”. He scored 66.31 points for his efforts, also a personal best. “I had fun out there. It was a great performance, and I think a lot about my character, the Sorcerer, and I work my magic out there,” said the wise-beyond his years performer. Though Zhou captivated the audience with his playful choreography, his technical merit was similarly well-executed. The middle school student opened with a nice double Axel, and saved the rest of his jumps—a triple Lutz-triple toe loop and a triple flip for late in the program, earning extra points for doing so. Chen, also 13, did not look like his usual self in his Prelude and Allegro program, uncharacteristically falling at the end of his step sequence, and struggling with his jumps. After the competition, coach Rafael Arutyunyan reported that Chen was struggling with illness today. Chen opened with a double Axel, and after the fall, struggled on his triple Lutz-triple toe loop combination. The landing on his triple flip was also labored. 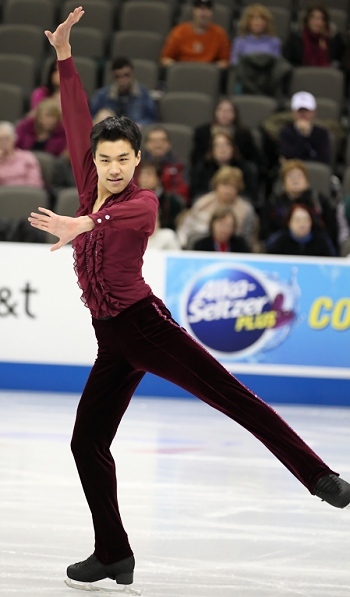 Still, Chen’s program component scores were the best of the night, keeping him in the hunt for a fourth consecutive U.S. title (novice, 2010, 2011, junior 2012). Finishing in fourth place was 18-year-old Jimmy Ma from Great Neck, NY, with 57.88 points. Jordan Moeller, 17, the 2011 U.S. novice silver medalist, finished fifth with 57.21 points. Jay Yostanto (18), seventh a year ago in this event, was sixth with 55.05 points. Earlier in the day, Tory Pastis, 17, and Joseph Johnson, 18, took the lead in the novice dance competition winning both phases of the pattern dances—the Starlight Waltz and Paso Doble, and earned 43.73 points along the way. The first year team trains in Colorado Springs with Patti Gottwein and former U.S. junior champion Trina Pratt. Chloe Lewis, 12, and Logan Bye, 14, the 2013 Pacific Coast Sectional champions, finished in second place with 41.25 points, and Gigi Becker, 10, and Luca Becker, 12, the 2013 Eastern Sectional champions, finished in third with 40.94 points. Tyler Pierce, 14, won the novice ladies short program with an entertaining program to Henry Jackman’s Puss in Boots. The 2012 U.S. Intermediate Ladies bronze medalist landed a triple Lutz-double toe loop combination and a triple loop, earning 45.66 points in the competition. Trailing Pierce by less than a point is Amy Lin, 13, from Fremont, Calif., who, like Pierce, also trains with Gambill. The 2013 Pacific Coast novice ladies champion earned 44.86 points with her Kung Fu Panda short program that was highlighted by her triple toe loop-double toe loop combination. Bradie Tennell, 14, from Carpentersville, Ill., finished in third place with 43.22 points. In the novice men’s competition, Tomoki Hiwatashi, who turned 13 today, took the early lead with a train conductor-themed short program to Orange Blossom Special. Coached by 1985 World Champion Alexander Fadeev, the leader landed a triple toe loop to start, and added a strong triple Salchow-double toe loop combination to earn 52.05 points in the competition. Nicholas Vrdoljak, 16, finished in second place with 49.53 points, while Oleksiy Melnyk, 15, finished in third place with 49.27 points. In novice pairs, Kaitlin Budd, 16 and Nikita Cheban, 19, won the short program with 36.42 points in their first season as a team. They overcame a strong challenge from Christina Zaitsev, 13, and Ernie Utah Stevens, 19, last year’s pewter medalists who earned 35.21 points. Finishing in third place was Elise Middleton, 13, and Robert Hennings, 16, who earned 33.74 points. The novice competitions come to a close on Monday, with all of the medals being awarded by day’s end. The junior men’s medalists will be decided on Tuesday evening, while the junior ladies skate their short programs on Monday evening.